The national government budget pattern causes a fairly reliable stock market movement each year. In June each year, money is drained out of the private domestic sector by taxes and the stock market sinks around this time. After January and up to June, the stock market rises with inflows into the private domestic sector from both the government and external sectors. Credit creation in Italy is running backward at present and has done for many years as the private domestic sector deleverages. 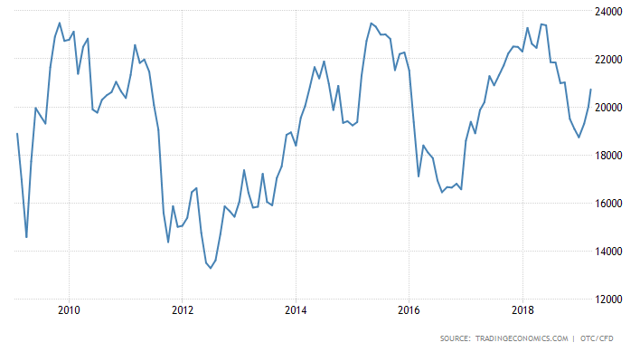 The purpose of this article is to assess the macro-fiscal flows for Italy and determine what effect these flows will have on the stock market and the economy. Macro fiscal flows impact investment markets with a lagged effect of typically one month. A flow of funds now from government spending or bank credit creation will lead to a boost in investment markets one month later. To understand the fiscal flows, one has to look at the balance of sectoral flows within the Italian economy using stock flow-consistent (SFC) sectoral flow analysis. Professor Wynne Godley first comprehended the strategic importance of the accounting identity, which says that measured at current prices, the government's budget balance, less the current account balance, by definition is equal to the private sector balance. GDP = Federal Spending [G] + Non-Federal spending [P] + Net Exports [X]. As a percentage of GDP, all three sectors sum to zero and balance each other out. Italy is not sovereign in the currency that it uses; it has no legal right to put more euros into circulation if it so chose. Italy uses the currency of the European Union (EU) and borrows euros at interest from the European Central Bank (ECB). In effect, Italy operates on a fixed exchange rate system similar to a gold standard. 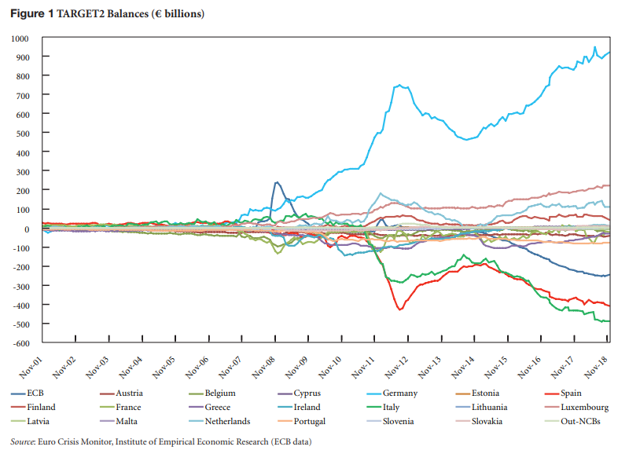 In the case of Italy, and the other EU members, a federal government deficit means that the government is in effect indebting itself to a foreign power and if it were to have trouble paying its national debt it could find itself treated like Greece and Cyprus were in the last sovereign debt crisis following the GFC boom-bust. What happens if a whole country – a potential ‘region’ in a fully integrated community – suffers a structural setback? So long as it is a sovereign state, it can devalue its currency. It can then trade successfully at full employment provided its people accept the necessary cut in their real incomes. With an economic and monetary union, this recourse is obviously barred, and its prospect is grave indeed unless federal budgeting arrangements are made which fulfil a redistributive role. As was clearly recognised in the MacDougall Report which was published in 1977, there has to be a quid pro quo for giving up the devaluation option in the form of fiscal redistribution. Some writers (such as Samuel Brittan and Sir Douglas Hague) have seriously suggested that EMU, by abolishing the balance of payments problem in its present form, would indeed abolish the problem, where it exists, of persistent failure to compete successfully in world markets. But as Professor Martin Feldstein pointed out in a major article in the Economist (13 June), this argument is very dangerously mistaken. If a country or region has no power to devalue, and if it is not the beneficiary of a system of fiscal equalisation, then there is nothing to stop it suffering a process of cumulative and terminal decline leading, in the end, to emigration as the only alternative to poverty or starvation. I sympathise with the position of those (like Margaret Thatcher) who, faced with the loss of sovereignty, wish to get off the EMU train altogether. I also sympathise with those who seek integration under the jurisdiction of some kind of federal constitution with a federal budget very much larger than that of the Community budget. What I find totally baffling is the position of those who are aiming for economic and monetary union without the creation of new political institutions (apart from a new central bank), and who raise their hands in horror at the words ‘federal’ or ‘federalism’. The two charts below show credit creation and loan growth by commercial banks over the last year. Over the last year, credit creation has gone backward with money being either paid back or written off as a bad loan. The flow of new credit creation adds to the stock of private debt which is the private sector's deficit and shown in the chart below. Italy's current account is in a surplus and adding about 2.6% of GDP. For a country operating in a closed economic fixed exchange rate system, an external surplus is really the only way that it can obtain debt-free 'freshwater' liquidity into its economy. What becomes relevant for a nation not sovereign in its currency is to what level it has been loaded up with foreign debt, and this is shown in the chart below. Italy's national government debt is in effect its stock of external debt owed to the ECB at interest and if not paid Greece- and Cyprus-type economic solutions are applied. Italy's external debt is 132% of GDP and makes Italy vulnerable to outside influence. ...Treaty on Stability, Coordination and Governance in the Economic and Monetary Union, commonly known as the Fiscal Compact – aimed at enforcing a permanent regime of fiscal austerity. To this end, ‘automatic correction mechanisms’ and quasi-automatic sanctions in the event of non-compliance with the rules have been introduced to remove any element of discussion and/or decision making at either the European or national level, thus accomplishing a lifelong neoliberal dream: the complete separation of the democratic process and economic policies, and the death of active macroeconomic management, in what has been described as ‘the politics of depoliticisation’.44 A second element has been the implementation (or imposition, depending on your point of view) of structural adjustment programmes (SAPs), consisting of internal devaluation (the reduction of wages), neoliberal structural reforms (the liberalisation/flexibilisation of labour markets and reduction of collective bargaining rights) and the privations of public services and assets – particularly in those countries that signed memorandums of understanding with the EU-ECB-IMF troika or entered into agreements for financial aid within the framework of the European Stability Mechanism. The chart below shows how the total financial claims between euro members. Lands such as Italy and Spain become the surplus of Germany and some of the other Northern European countries. One sees from the Greek experience what happens when the debts are called in. How long can this imbalance continue? The table shows that the private domestic sector is in positive territory, which allows it to accumulate net financial assets. The private domestic sector is being boosted by inflows from both the government sector and the external sector. Italy's membership of the EU means that it will be commanded by the EU and ECB to reduce its deficit spending because it has a stock of government debt larger than the guideline of 60% of GDP and even then only allowed a maximum of a 3% deficit budget per year. Like France, Italy is expected to reduce its deficit spending and lower its stock of debt to below 60% of GDP, that is regardless of the actual need to have a deficit larger than 3% of GDP to advance or maintain the public purpose. This has already happened in the last round of Italian national budget making where it had to make revisions to its national budget until it was 'approved' by the unelected officials of the EU in Brussels. 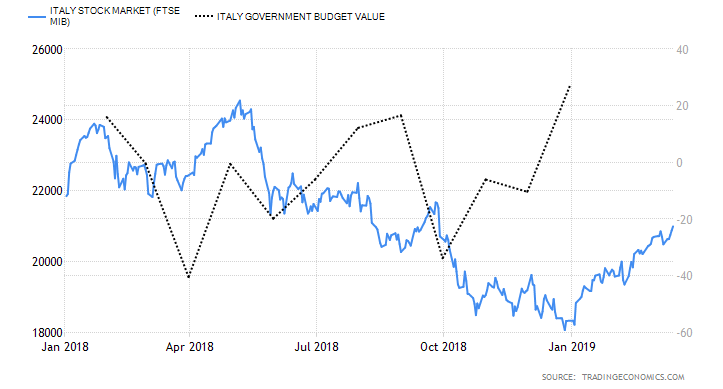 At the same time, the ECB used its interest rate management powers to let Italian government bonds rise during the budget negotiations to bring the Italian politicians to the table. So one can expect the private domestic sector surplus to diminish over time. One sees from the credit creation chart above that households and businesses have been using their surplus to reduce their private debt levels. The Italian stock market is no higher now than it was ten years ago though it has had some good tradeable peaks and troughs in that time. In Italy, the fiscal year is the calendar year, January 1 to December 31. There are two main peak times in the year when tax is extracted out of the private domestic sector and this is June 30 and October 2. The national government adopts its new budget for the year in December. A major cash injection into the private domestic sector occurs in January as the various government departments spend out of their newly charged-up budget accounts. The chart below shows this pattern. A stock market rise in both Januaries shown. A decline can be expected in June and a further decline in October as more cash is extracted out of the private sector. 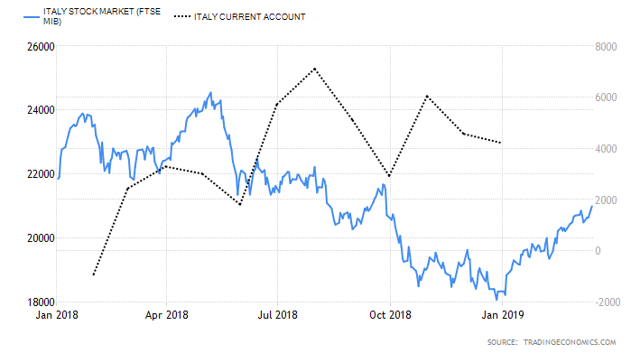 The run-up to the June tax payment time is not a good time to invest in the Italian stock market. The seasonally best time to enter the stock market is October after the second round of taxation for the year and before the big spend up month in January and hold into the first quarter of each calendar year. The chart above shows the stock market juxtaposed with the current account flow of funds. The current account has to be taken into account when looking for a seasonal pattern as it is such a large flow of funds and contribute over 2% of GDP each year. The current account does indeed peak and trough with the seasons and troughs in December and peaks in June, a winter/summer pattern. This helps offset the government flows which are the reverse with an injection in January and an extraction in June and October. When one contrasts this phenomenon with the stock market, in the chart above, one sees that generally speaking, each calendar year begins with a dip and then a recovery - money extraction followed by money injection. One must observe the global macro influences as well in this globalised world. The chart above was kindly produced for me by Mr. Robert P. Balan as part of his PAM service and shows global financial flows for the five largest developed economies in the world. I recommend the PAM service for its advanced fiscal flow analytical capabilities. The chart shows that global G5 bank balances are bottoming at present and will rise sharply into June 2019. The national flow of funds will be bottoming in June at the same time as global funds are peaking. This would tend to even out the impact and make for less than fruitful investment returns. Certainly, there are other countries where the reverse situation is true such as the USA. 1. National - that tend to have a one-month lagged impact on the stock market. 2. 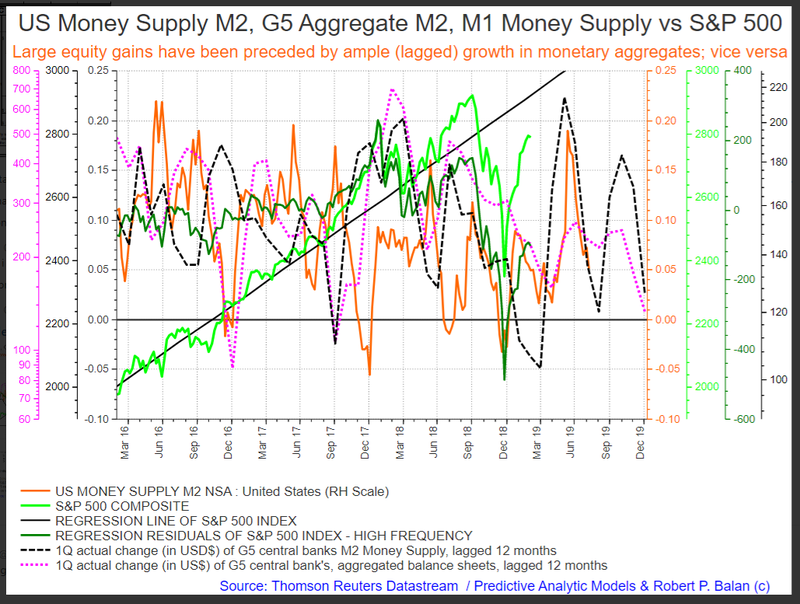 US M2 flows - lag 6 months. 3. G5 M2 flows - lag 12 months. The last two flows in the chart above have been 'advanced' to represent the lagged impact on the market and in this role are a leading indicator for the stock market. The chart uses a rate of change calculation as experience has shown that it is not the size of the flows that matter but their rate of change.